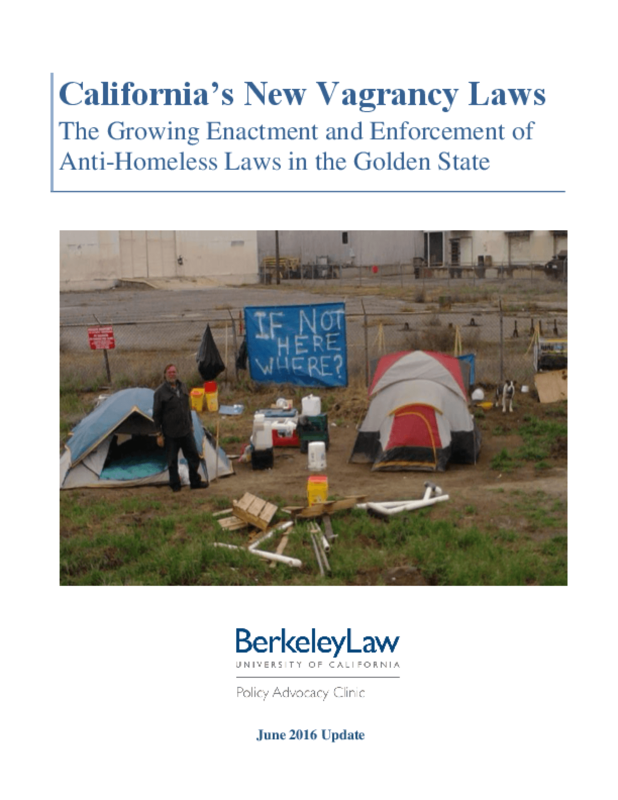 This report updates our 2015 study on the enactment and enforcement of anti-homeless laws in California with new ordinance data from cities and updated arrest data from the FBI's Uniform Crime Reporting Program. We find that California cities are enacting and enforcing anti-homeless laws in record numbers. In contrast with historical post-recession trends, arrests of people who are homeless continue to rise in spite of an improving economy. Further, cities appear to be arresting people increasingly based on their homeless status as opposed to any concrete unlawful behavior. The Policy Advocacy Clinic prepared this 2016 update for the Western Regional Advocacy Project (WRAP). WRAP is a non-profit organization that was created to expose and eliminate the root causes of civil and human rights abuses of people experiencing poverty and homelessness. WRAP seeks to develop socially just solutions to all the barriers that prevent the ending of homelessness. Copyright 2016 by Western Regional Advocacy Project (WRAP). All rights reserved.